Shifting to Bangalore for my first job was really exciting as I have always dreamt of living in the Bangalore, – the city of happenings. Yes, that was my first job as Associate in a leading company (that I got through campus recruitment). It all went fine until one day when I felt that my dresses were not fitting me anymore. I had to buy new clothes every month for every new office celebrations and I started having difficulty in breathing while walking or climbing stairs. I knew there was something wrong with me. I felt like my whole body was transforming and I had a body weight check-up. To my shocking surprise, I had gained 8 kg within a month. Frequent parties, birthday celebrations and team lunch had made me look fluffy and unhealthy. I had to control this to get back to my old healthy look. When I did research, I found out that 80% of people who work in offices and follow unhealthy dietary habits have gained weight.So, what can be done in such cases? Well, the solution is quite simple. Having a full-fledged meal during work hours, but that not possible due to team meetings and deadlines. Following a healthy snack habit can actually work wonders on your body and weight. Trust me!! I have switched on to eating healthy snacks rather than ordering junkies and I could really find the difference. So if you are one among those like me, who are trying to lose weight by following a healthy snack plan, then this one’s for you. Almonds are known as a healthy weight loss snack that is proven effective for many people. 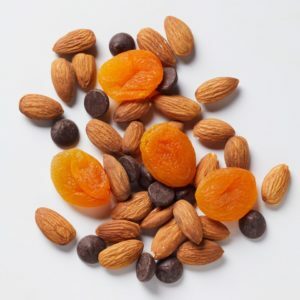 A recent study has found out that people who had almonds (up to 40) felt fuller and stronger than those who had burgers. Almonds are also rich in fibre, protein and healthy fats. 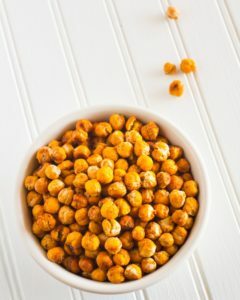 Roasted chickpeas or roasted chana is one of the healthy Indian snacks for weight loss that is perfect for tea time. It contains protein with zero % fat. If you are not a spicy lover, you can try eating plain chickpeas as well. At times, it happens that we might feel extra hungry than normal. This happens to all of us and hence not to worry. You can fill your snack Tiffin with oatmeal that has good amount of fibre and protein. 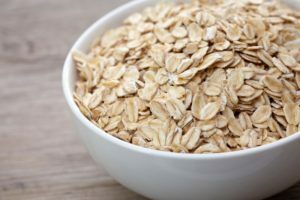 Oatmeal is one such weight loss snacks said to suppress your appetite and results in healthy weight loss. Also, Read About Dry Fruits in Hindi: Benefits Of Oats In Hindi. 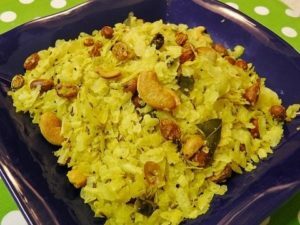 Dry poha or Chiwda in hindi, is a great Indian snack for weight loss that you can carry along with your office meal box. Make sure you carry plain dry poha and roast it with few peanuts, curry leaves, mustard seeds, black pepper and salt to make it a bit spicy and healthy. Just mix them and and try not to use oil as it can result in fat gain. For all the popcorn lovers out there, you will love this. A bowl full of popcorn can make curb your cravings for the snack time. It is high in fibre and delivers rich protein. 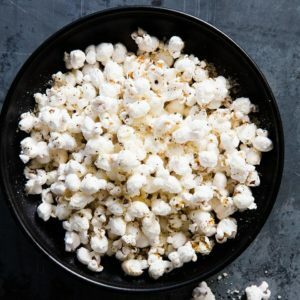 A bowl of air-popped popcorn has 4 grams of fibre, 4 grams of protein and over 1 gram of fat. For spicy lovers, who would love to try something different other than the nuts and almonds this is a perfect snack. All you need is a 1.25 ounce chickpeas, a clove garlic , ¼ cup olive oil, 2 tablespoon fresh lemon juice, 1 teaspoon ground cumin, kosher salt and ¼ teaspoon paprika. 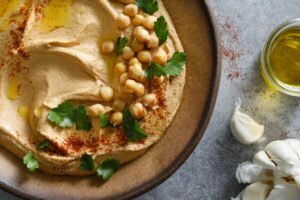 In a food processor, mix the chickpeas and garlic with olive oil, lemon juice, cumin and ¾ teaspoon salt until the mixture turns smooth and creamy. Add 2 tablespoons of water as necessary to achieve that consistency. Now transfer to a bowl and drizzle with olive oil and sprinkle some paprika before serving. Dry fruits are one among those healthy snacks for weight loss. 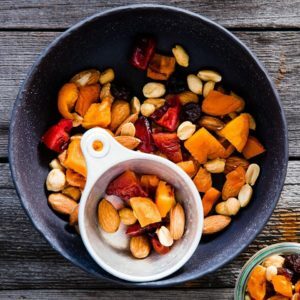 Pick a bowl of dry fruits and have it when you feel hungry in between your work hours. You can include dried mango, dried apple, dried banana and dried apple in the list. This snack is rich in fibre and nutrients. It also acts as a great source of energy and burns excess calories. Also, Read About Dry Fruits in Hindi: Dry Fruits Benefits In Hindi. 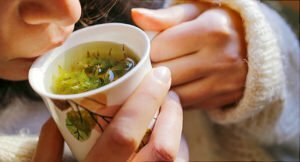 Not just snacks, even tea can make wonders on your weight. During your hectic work hours, taking a break and drinking a cup of herbal tea can suppress your appetite and cravings till mealtime. When I say tea, it’s not the cappuccino or cuppa-milk tea that I am referring. Instead drinking black tea, chamomile tea or green tea can have great effect on your health and weight. Also, Read About Dry Fruits in Hindi: Green Tea Ke Fayde Or Nuksan. Apart from these weight loss healthy snacks, you must try practising a healthy diet and exercise to make yourself fit and healthy. These above mentioned authentic Indian snacks have really helped me burn out the excess calories and curb my appetite.